Diehard Movie Poster 27 x 40. Die Hard is a 1988 American action film directed by John McTiernan and written by Steven E. de Souza and Jeb Stuart. It is based on the 1979 novel Nothing Lasts Forever, by Roderick Thorp. 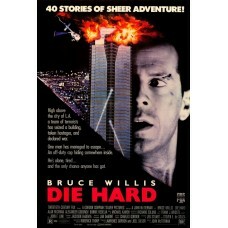 Die Hard follows off-duty New York City Police Department officer John McClane (Bruce Willis) as he takes on a group of highly organized criminals led by Hans Gruber (Alan Rickman), who perform a heist in a Los Angeles skyscraper under the guise of a terrorist attack using hostages, including McClane's wife Holly (Bonnie Bedelia), to keep the police at bay.